SKU: N/A. Categories: Printer Ribbons, Supplies & Accessories. Thermal transfer printing with ribbon delivers a permanent, crisp print, ideal for long-life product labelling, and when labels are exposed to direct sunlight, heat or outdoor conditions. Thermal Transfer Ribbons are designed to bring out the best in your printer and prolong the life of your printhead. Our thermal printing experts can help you match an appropriate ribbon to your label material or application, as well as providing advice on the correct label printer temperature and print-speed settings. Wax ribbons are suitable for general purpose printing on paper stocks, making it for ideal carton labelling applications. The high ratio of wax in the formulation means these ribbons have a lower melt point, so a lower heat setting can be used on the printer and high print speeds are achievable. Wax ribbons are the most economical ribbon. 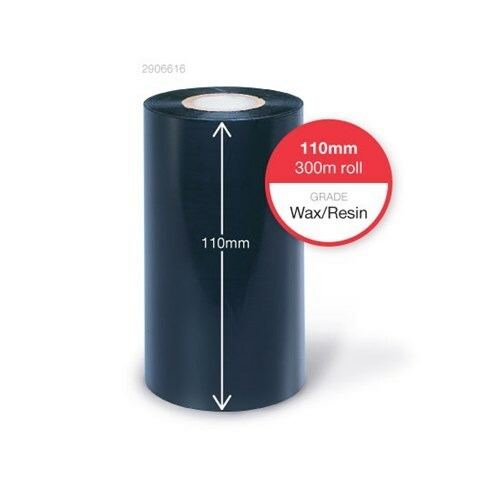 Wax/Resin ribbons provide a finer image on very smooth or coated and gloss paper labels and some synthetic stocks (e.g. polypropylene, polyethylene, polyolefin). The printed image is more durable than wax, ensuring excellent resistance to scuffing or rubbing which can be a common problem for freight.